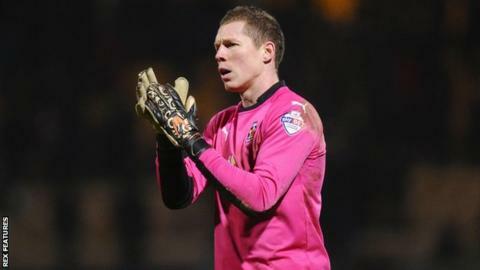 Cambridge United goalkeeper Chris Dunn will be out for between four to six weeks with a groin injury. The 27-year-old has made nine appearances for the U's this season, but has not played since being sent off against Wycombe on 29 September. "Sam Beasant will now have an opportunity to cement a spot in the team, which he had in pre-season and did well," said U's boss Richard Money. Cambridge host Portsmouth in League Two on Saturday. Pompey lost to Exeter and drew against Yeovil at Fratton Park in their last two matches, and lie fourth in the League Two table. But Money believes Paul Cook's side are the best side in the division. "They are champions elect in my opinion," he told BBC Radio Cambridgeshire. "The last two home games they've stuttered a little bit, but looking at them I can well imagine why it's more difficult at home than away from home. "They're perfectly set up to play away and their record so far is extremely good. It's going to take a really good team to overtake them, and I don't think there's one in the division."